It started with a little (2 ft) broom that sang “Put A Spell On you” – an ancient discard of a four year old with the attention span of a flea. I lengthened the handle, added jewels and some plentiful weeds from my disgraceful yard. When channeling Winifred, I found she was less than impressed with cloning what the store had to offer, so we burrowed into my closet and found a purple skirt! Only laziness had saved the matching blouse and green jumper (neither of which fit) but no worries – I corralled the bare bits with my favorite faire corset, cut the jumper open and ruched the back for effect. Then - a weird impulse buy from 10 years past (don’t ask) purple boots! The thrift store cinch belt was upgraded like the other items – with green glass, jewels, decorative buttons and medallions. To top it off - a velvet super hero that I ripped off from the grandkid’s toy box – they’ll never miss it – and tricked out with bead fringe, tassel, my trusty rubber stamps and gold fabric paint. All that said, Winnie must have her mad personality and of course, “It’s all about that face – big trouble.” Rest assured - I am suitably mad – but the store bought teeth would not do. So after much trial and mostly error, I was able to make them from mold-able plastic and fake fingernails. I love them and plan on wearing them to the dentist next week. I did my waist length red hair in rags for a couple of days (Yikes curls!) and painted in the widow’s peak. Using a ridiculous curly wig that I rolled up and attached to the top of my head – and with the aid of foul language, poking, prodding, two thousand one hundred and nine pins, much twisting, ratting, hair spray – and help from the hair Gods… Voila! Winifred Sanderson! You've done it again, Darlene. Fabulous. 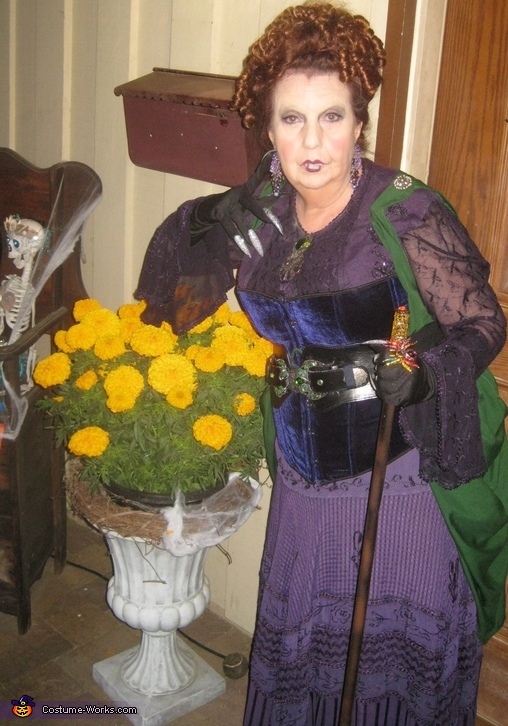 Fits the character Bette Midler portrayed in Hocus Pocus. Love it! There is no link to voting. You nailed it!! I wish you could post a video. You did an outstanding job on recreating her look voice and character. I'm so impressed how you made her teeth and coat. Can't wait to see other cool costumes & makeup you create.